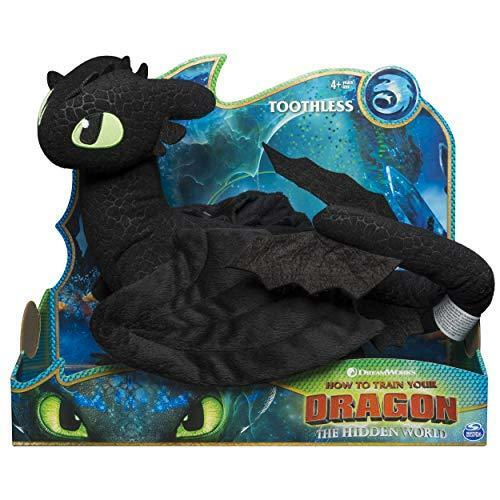 Toys & GamesDolls & Stuffed ToysStuffed & Plush Animals Toys > Toothless Dragon Plush Figure Toy For kids by Dreamworks Dragons - 14"
14-Inch deluxe Plush: soft, plush materials make your Toothless Dragon from DreamWorks how to Train you Dragon: the hidden world so huggable from head to tail. At 14 inches long, Toothless is the perfect size for dreamtime! Looks like movie character: The Toothless deluxe Plush Dragon has authentic movie looks from head to majestic wings to tail fins. It s a great plush collectible for Dragon lovers and how to Train your Dragon fans! Let your imagination soar with Dreamworks Dragons toys: use your new Dragon to recreate exciting scenes from the fantastical DreamWorks movie, How to Train your Dragon: the hidden world. The Dreamworks Dragons deluxe Plush Dragon are adorable Buddies for kids and Dragon trainers aged 4 and up. Take flight over the Dragon world today! User Comments About Toothless Dragon Plush Figure Toy For kids by Dreamworks Dragons - 14"